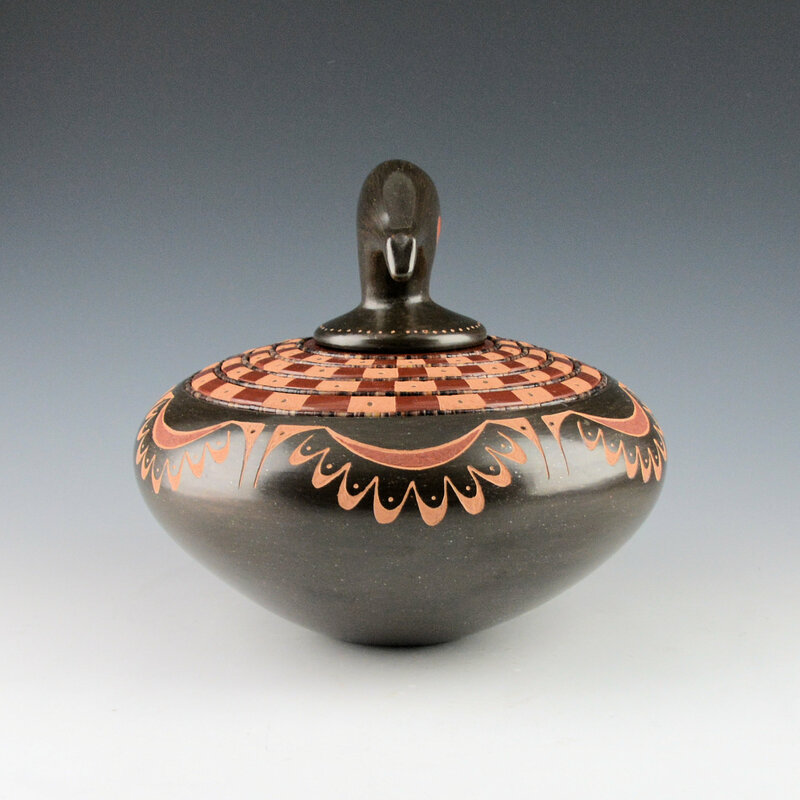 This is an exceptionally designed bowl by Russell Sanchez. 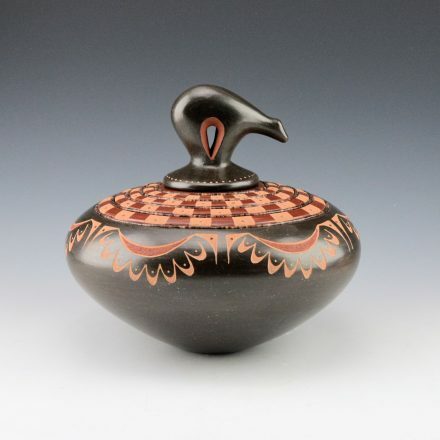 His recent work is a modern take on historic San Ildefonso pottery. The sound shape of the bowl is perfect for both the etched designs and the bear lid, with a graceful flow of form. 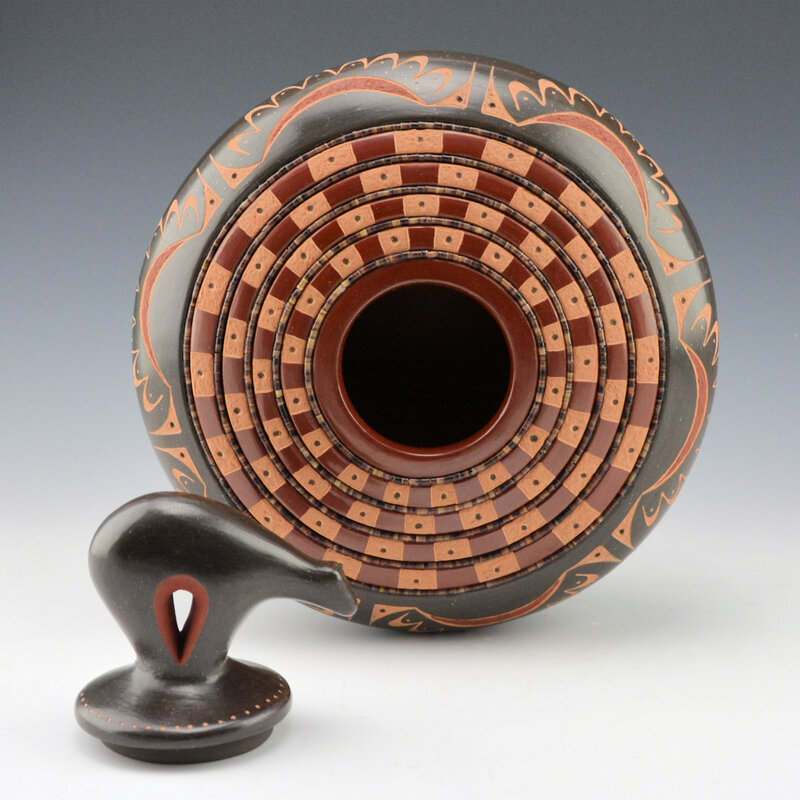 The lower half of the bowl is fully polished with a black micaceous clay slip and then etched with a sun design. The sun design in one that was a pattern often seen in the work of Tonita Royal. 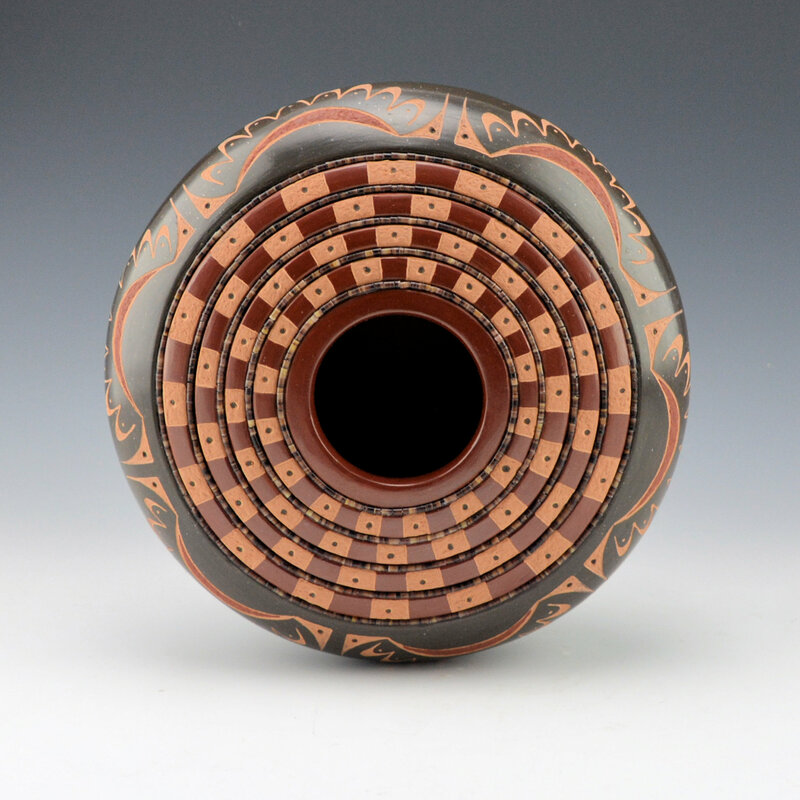 Note how the design is further highlighted with a matte red clay slip, which is applied before the bowl was fired! However, it is the space from the shoulder to the neck which is the visually dynamic part of this bowl. Russell has etched a series of squares which alternate from a deep polished to matte. The square spiral in towards the mouth of the bowl and each row is separated by a band of shell hei-shi beads. The checkerboard pattern is a cornrow design, with the small dots representing the corn kernels. 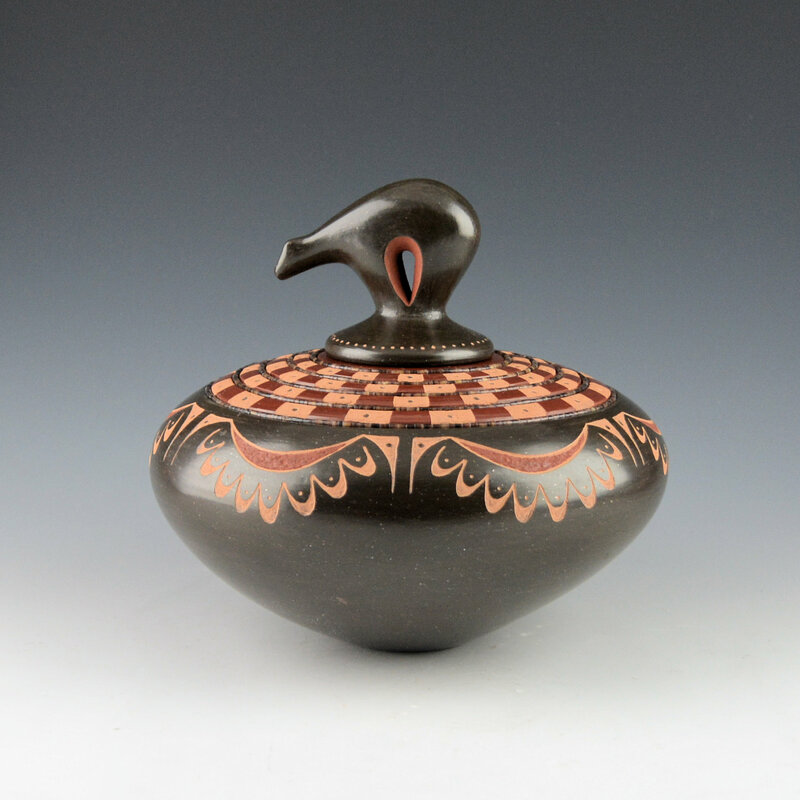 The bear lid is also polished black and the small dots on the edge of the lid are a visual repetition of the dots on in the design on the bowl. The shape of the bear is very sculptural and the elongated head seems to perfectly match the wide shape of the jar. Of course, the final touch is the inside of the bear is slipped red! Wow! A lot going on in one piece, that seems simple but there is a dynamic complexity inherent in the piece. The piece was traditionally fired outside and it is signed on the bottom in the clay. Simply perfect!